In 1974 Tom Jackson designed Carolina Shores Golf Club and it has long been known as a challenging but fun Myrtle Beach golf course. Carolina Shores is conveniently located just a few minutes from North Myrtle Beach in Calabash, North Carolina and it is a course for everyone. It can offer a challenge to the expert player as well as provide a fun Myrtle Beach golf experience for all skill levels. The course winds itself through tall tree lined fairways and incorporates plenty of strategically placed water hazards and bunkers, so accuracy is required. 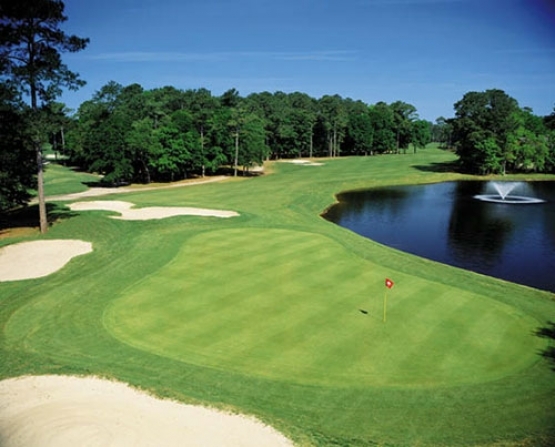 Carolina Shores Golf Club is the perfect golf course to include on your next Myrtle Beach golf vacation. Myrtle Beach golf packages are available that incorporate any golf course located along the Grand Strand. North Myrtle Beach is the perfect place to stay if you are wanting to play Carolina Shores, as it is literally only a few minutes away and still makes it convenient to enjoy all the North Myrtle Beach attractions, condos and hotels and nightlife. After your round of Myrtle Beach golf with your Myrtle Beach golf package at Carolina Shores you might want to stop in at any of the world famous Calabash seafood restaurants and enjoy some of the wonderful seafood.